A broad, multidisciplinary field, health science focuses on the way food, physical activity, work, family life, and other environmental factors affect human health. As an applied science, health science also explores the way healthcare settings employ mathematics, engineering, and technology. Subdivisions of health science include medicine, pharmacology, exercise science, diet and nutrition, psychology, and healthcare management. Health science benefits students who plan to pursue careers in nursing, pharmacy, medical technology, counseling, and other professions involving patient treatment and care. Many health science professionals begin their career as undergraduates, although certain occupations require advanced education, work experience, and professional certification. The best bachelor's in health science programs not only introduce key concepts to students, but also prepare them for additional career requirements. Curricula for health science bachelor's degrees commonly include practicum (or onsite) courses and internships. Today, many students choose to earn their bachelor's degree in health science online. Web-based students follow the same rigorous curriculum as their brick-and-mortar counterparts, leading to the same number of post-degree job opportunities. The asynchronous (or self-paced) format of most online health science programs also helps students with part-time jobs, childcare duties, and other responsibilities that may interfere with campus-based learning. Learn more about what you can do with an online bachelor's degree in health science and the career opportunities to which you can look forward with this comprehensive guide. Health science is a multidisciplinary field that combines the biomedical, psycho-social, organizational, and societal aspects of health and diseases. What is a Health Science Major? Health science focuses on the way food, physical activity, work, family life, and other environmental factors affect human health. A health science bachelor's degree curriculum includes courses in biomedical ethics, human anatomy, and technical writing. Can You Teach With a Bachelor's Degree in Health Science? A bachelor's in health science prepares graduates to work as health educators and community health workers who teach courses, develop outreach programs, and promote healthy lifestyle choices. What Can You Do With a Health Science Bachelor's? Professionals with a health science bachelor's degree assume positions as dieticians and nutritionists, health educators and community health workers, medical and health services managers, and exercise physiologists. Will An Online Health Science Program Provide Me With The Skills I Need To Advance My Career? Online bachelor's in health science programs introduce students to medical technology, healthcare administration, nutrition science, and other fundamental areas of the field. Students supplement their coursework with hands-on internships and practicum courses where they receive supervised training from experienced professionals at clinics, labs, and other worksites. Those who graduate from an online health science bachelor's program can immediately enter the workforce, obtain professional certification, or continue their education with a graduate degree. Will An Online Health Science Program Work With My Schedule? Online bachelor's in health science programs represent a flexible alternative to traditional, classroom-based education. From the comfort of their home, students can access course lectures and readings, participate in virtual discussions with other students, submit written assignments, take exams, and contact their professors. Current technology also allows learners to study away from their personal computer using a laptop, tablet, smartphone, and other portable devices with Wi-Fi capabilities. For added convenience, online students can usually coordinate internships and practicum courses at sites near their current residence. What Jobs Can I Get With My Health Science Degree? Students who graduate with an online bachelor's degree in health science qualify for a range of career pathways: health educators, dietitians and nutritionists, exercise physiologists, medical and health services managers, and research scientists. Students should note that some or all U.S. states require state-issued licenses and/or certifications for many of these professions. Although the licensure process varies by state, requirements usually include a comprehensive exam and post-degree work experience. The University of West Florida offers three options for an online bachelor's degree in health science. The general health sciences program provides a wide foundation of knowledge and skills necessary for success in the field. The healthcare administration specialization prepares graduates for leadership roles within healthcare organizations. The public health specialization helps students develop skills for careers in government agencies or nonprofits which approach health issues on a larger scale. Nested within the Department of Health Sciences and Administration, this degree follows an online format for students who are already working or who don't live in the Pensacola area. Course offerings include instruction on medical terminology, physiology, and epidemiology, as well as internship and research opportunities. This program is ideal for students who want to enter the healthcare field, advance their existing career within the field, or continue onward to graduate school. While UWF offers all major courses online, some general education courses and electives may not be available in a distance learning format. Founded in 1963, UWF is part of the State University System of Florida. Classes commenced in 1967, and since then, UWF has graduated over 87,000 alumni and awarded more than 100,000 degrees in 70 fields. Over 12,800 students currently attend UWF, 27% of which take courses entirely online. UWF is accredited by the Southern Association of Colleges and Schools Commission on Colleges, and holds accreditation from the Council on Education for Public Health and the Commission on Accreditation of Allied Health Education Programs (CAAHEP). The University of Missouri offers a 100% online health science degree that prepares graduates for a variety of nonclinical careers in the healthcare field. Some graduates pursue careers as health educators, patient representatives, or clinical data managers, while others go on to graduate school to pursue additional credentials. Students can complete the program through a mix of self-paced and semester-based courses without any required time on campus. However, some of the science courses required to pursue a graduate degree may not be available online. Courses cover such topics as public health principles and practice, clinical ethics, and research methodologies. Students can also explore opportunities for hands-on learning. The core curriculum features a writing-intensive clinical ethics course and a capstone project. Students have their choice of 18 credits of electives, allowing them to tailor their degree to their specific interests within the field. This program requires students to complete 120 credits. Transfer students can bring up to 56 credits with them, greatly reducing their cost of attendance by reducing the number of credits needed from the university. The school also offers tuition discounts for military veterans, active duty personnel, military dependents, and graduates of community colleges. Mizzou holds accreditation from the Higher Learning Commission. The school provides online classes for thousands of students every year, including learners from all 50 states and 21 countries. Based in Norfolk, Virginia, Old Dominion University offers two online health science degrees: one in public health and another in health services administration. ODU's College of Health Sciences School of Community and Environmental Health offers both options as degree completion programs. Students in these programs have a variety of options for completing general education requirements and foundational courses, but must complete at least the final 30 credits while enrolled at ODU. The public health specialization prepares graduates for careers that impact health and quality of life within communities, from the local level to a global scale. A growing sector of the healthcare industry, public health has become increasingly important in the modern globalized world. Graduates are able to identify trends in diseases, educate the public, and help protect communities from preventable problems. The specialization in health services administration benefits working students who already have experience in the healthcare field, though this is not a requirement for enrollment. This program prepares students for middle management, upper management, and administration positions within healthcare. These roles may include operating a private practice or directing operations in a hospital or agency. Demand for these jobs has continued to increase as the population grows and ages. The bachelor's in public health is one of the few such programs in the country that holds accreditation from the Association of University Programs in Health Administration. The online bachelor's degree in health science from Ohio State University provides students with the science background necessary for a variety of careers within the healthcare field. This program is available 100% online, with no required time on campus. Students may complete their general education courses at OSU or may begin studies elsewhere and transfer credits in order to save money. Courses in the program include health promotion and disease prevention, the application of ethical decision making in healthcare, and individual differences in patient populations. Part of the College of Medicine, this program is taught by world-class faculty working at one of the leading public universities in the country. Students who do not reside in Ohio pay a higher rate than in-state students; however, tuition costs much less for online students than on-campus students. OSU holds accreditation from the Higher Learning Commission of the North Central Association of Colleges and Schools. The school has been authorized to grant degrees to students from Puerto Rico, the U.S. Virgin Islands, Washington D.C., and 49 states, with limited authorization in Colorado. OSU consistently ranks among the best universities for online courses, and has over half a million alumni around the world. A land-grant college founded in 1870 thanks to the Morrill Act of 1862, OSU was the ninth university in Ohio. Today, the main campus in Columbus is the third-largest university campus in the United States. More than 68,000 students currently attend OSU across all of its campuses. The University of Iowa offers an online health science degree that draws upon psychology and rehabilitation studies. The school produces graduates with knowledge of both health science and the social aspects of healthcare. This program prepares students for a variety of entry-level jobs, provides working professionals with the education they need to advance their careers, and forms a solid foundation for students who wish to continue their education in graduate school. The program consists of three or four foundational courses, followed by six upper-level courses. Students can choose from a wide selection of classes in each category, allowing them to tailor their education to their own individual interests. Foundation courses cover topics such as physiology for radiation medicine, elementary psychology, gerontology, and Spanish for healthcare providers. Upper-level courses include the psychology and biology of aging, bereavement, sexuality, and vascular anatomy. Students completing a degree through UI can do so completely online, and the school does not require distance learners to visit the campus. The university invites interested students to attend commencement and receive their degree on the Iowa City campus. UI also welcomes online students to visit campus at any time to participate in events. The university offers 41 distance learning programs with 617 available classes. Founded 59 days after Iowa became a state, UI was the first university in Iowa and has been pushing the frontiers of education ever since. Rutgers University School of Health Professionals offers an online health science degree completion program with four tracks: aging, psychiatric rehabilitation, management and education, or allied dental education (offered jointly with Thomas Edison State University). Graduates demonstrate the ability to apply professional values in the field. Students participate in a collaborative work environment to serve the best interests of their patients, communities, and teams. Students may choose from eight-week or 15-week course options, and may pursue the degree full time or part time as their needs dictate. Since the degree completion program primarily educates working professionals, Rutgers expects most students to study part time. Students have eight years to complete the program. Applicants must have completed an associate degree from an accredited allied health education program or an equivalent. Candidates should also submit two letters of recommendation and have a GPA of 2.5 or higher. Students applying for the psychiatric rehabilitation track must have a 3.0 GPA or higher. All students must complete five core courses, which cover topics such as scientific inquiry, healthcare organizations, and cultural issues in healthcare. Students do not have to complete courses in a specific sequence. The remaining courses in the program vary based on the student's chosen track. Students must also complete a 160-hour, four-credit practicum in the form of a directed field experience. Learners tailor this experience to their individual interests and career goals. Rutgers allows distance students to complete the practicum outside the state of New Jersey. Working professionals can complete an online bachelor's degree in health science at Nova Southeastern University after only 30 credits at the school. Courses in the program cover topics such as current events in health care, epidemiology, health policy, research design, and patient education. Students also have the option of pursuing the healthcare administration track. Courses use an entirely online format, with pacing determined by individual professors. Students must complete at least 30 of their credits within the program, including at least 21 credits of foundational courses. The program offers a variety of course options, allowing students to plan an education that prepares them for their specific professional interests. As a degree completion track, this online health science program expects applicants to have met general education requirements for a bachelor's degree. Applicants must hold at least an associate degree in a health field or a post-high school certificate of completion in a health field with a 2.6 or better GPA. Applicants must also have completed three credits (or the equivalent) of college level writing courses. The admissions team prefers applicants with a variety of educational backgrounds and work experiences. Applicants must demonstrate that their education or work experience was earned within five years of applying. Excelsior College offers an online bachelor's degree program in health science with three concentration areas. This program is designed with working adults in mind, and offers flexible online courses to accommodate busy schedules. Excelsior accepts up to 32 credits for professional licenses and certifications, the equivalent of 25% of credits required for the full degree. Excelsior offers concentrations in health and wellness, public health, and healthcare management, allowing students to focus on an aspect of the healthcare industry that most interests them. All three concentrations follow the same format and require the same core courses. Students must complete 60 credits in health science courses, including nine from a chosen area of emphasis. Core courses include healthcare issues in diverse populations, healthcare informatics, and research for evidence-based practice. These courses provide the foundation on which other courses build, and prepare students for work in a variety of careers within the healthcare field. Headquartered in Albany, New York, Excelsior College is an accredited nonprofit institution focused on distance education. Since its foundation in 1971, Excelsior has worked to help adult learners and working professionals earn degrees. Over 172,000 students have graduated since the college opened. Today, the college enrolls more than 28,000 students in nearly 40 different programs. 95% of all students complete their programs at Excelsior, and most do so in 2.7 years. Many students attend the school while employed full time or on active military duty. The University of South Dakota's online health science degree prepares graduates for a variety of career options, with six different academic pathways to choose from. Students can choose a preprofessional bachelor's degree program, designed to prepare students for advanced study in a medical field. The health care studies option prepares graduates for nonclinical work in the healthcare industry. Healthcare advancement studies is a completion program for working professionals with an associate degree in health science. Undergraduate clinical informatics focuses on the use of technology and electronic health records to improve healthcare. The undergraduate public health option prepares graduates to address epidemiology and public health issues. Finally, the undergraduate research track prepares students for careers or further study in various forms of medical research, including biostatistics. Courses use a fully online format. These online health sciences programs require 44 credit hours of core classes plus electives. In addition to normal prerequisites, some courses require instructor permission, CPR training, immunizations, and criminal background checks. USD offers over 40 programs online, The school charges the same tuition rates for in-state and out-of-state students. Founded in 1862, USD is the oldest university in South Dakota. The school has educated over 70,000 alumni and currently enrolls more than 10,000 students. George Washington University offers an online health science degree specifically geared toward military personnel. This degree completion program encourages military personnel to apply their existing training toward a full degree from the university, allowing them to more easily transition to civilian employment or prepare for advanced education in a medical field. The degree also benefits personnel who wish to pursue more specialized positions in the military. This program only accepts active duty personnel. Specifically, applicants must be Navy Independent Duty Corpsmen, Army Special Forces Medical Sergeants, or Air Force Independent Medical Technicians. The application process is otherwise typical of such programs, requiring transcripts, letters of recommendation, and a statement of purpose. Students must complete 36 credits at GWU, including one elective course. Required courses cover subjects such as current issues in bioethics, human physiology in extreme environments, and infections disease and bioterrorism. The program also requires three practicums, which students complete in their current stations under the supervision of an MD or PA. These practicums allow learners to practice their skills and gain clinical experience. Elective courses include healthcare in developing nations and integrated response to high impact violent incidents. Based in Washington, D.C., the GWU School of Medicine and Health Services has a longstanding working relationship with the U.S. Army and Navy. The university hosts several programs geared toward active duty personnel. Since its foundation in 1821, GW has provided students with not just an education, but the experience and networking potential of studying in the nation's capital. Mercy College of Ohio offers an online health science degree focused on healthcare administration. This program blends health science with leadership and management to prepare students for growing career options in the healthcare field. Coursework in the program covers topics like organizational behavior, healthcare law and ethics, and healthcare marketing. Applicants must have an associate degree or 60 transferable credits, including courses in natural science, social or behavioral sciences, writing, and math. The school prefers applicants with a 2.3 or higher cumulative GPA, though the admissions office considers learners with a GPA as low as 2.0 on an individual basis. Students who do not have prior work experience in healthcare must complete a one-credit, 120-hour practicum in order to graduate. The school waives this requirement for students who obtain or continue employment in the healthcare industry during their program. Mercy is a Catholic institution founded in 1918 as a school of nursing. The college holds accreditation from the Higher Learning Commission and authorization from the Ohio Department of Higher Education. Because of its significant focus on healthcare education, Mercy also holds other accreditations from groups such as CAAHEP and the Ohio Board of Nursing. Though a Catholic college, most of the more than 1,500 students at Mercy are not members of the Catholic faith. Mercy also puts an emphasis on serving the global community, regardless of religious affiliation. The University of North Carolina at Greensboro's online bachelor's degree in health science focuses on public health. Graduates gain the skills necessary to monitor health trends to predict dangers, research preventative measures, and educate communities in order to protect their health. By approaching the subject from an intersectional perspective, graduates of this program are able to discover their specific niche within a broad field, promoting research and solutions that help prevent injury or illness in the first place. As a degree completion track, the program expects students to transfer credits from another institution. Learners may apply up to 64 credits from a community college toward this 122-credit program. The program requires 36 credits of core courses and another 18 credits of health electives. Core courses include gender and health, the impact of income and social status on health, and data analysis in public health. Elective courses cover topics such as immigrant and refugee health, human sexuality, and medical terminology for public health professionals. The program begins in the fall semester and ends in the spring semester of the student's final year, culminating with a capstone project. Students must submit applications by April 1 to be considered for acceptance into the fall semester of that year. Applicants must possess an associate or bachelor's degree with a 2.5 cumulative GPA or higher. They must also have completed (with a grade of C or better) courses on biology, composition, sociology or psychology, algebra or higher, business computing, and public speaking or workplace communication. Founded in 1966, Bellevue University operates as a private school and admits more than 80% of all students who apply. It offers over 80 degrees in high-growth areas to roughly 9,000 students a year. The school hosts campus locations in Nebraska, Washington, Idaho, and Iowa; it also has popular online programming. The online bachelor of arts in health sciences at BU features two areas of emphasis: science and eldercare. Students must complete a total of 127 credits, including 36 in general education, 50 in electives, and 40-41 in the major. The core of this online health science degree includes courses on psychology, medical terminology, health communication, medical ethics and leadership, applied statistics, and a choice between wellness or nutrition. A student's target career path — either clinical or nonclinical — determines which area of focus they should follow. The science emphasis is designed for medical professionals, while the eldercare emphasis targets learners who aspire to work in healthcare administration. This program also helps prepare students who plan to go on to medical school. BU does not require college admission tests as part of its application process, although students must hold a high school diploma, GED certificate, or proof of homeschool completion. Bellevue University holds regional accreditation from the Higher Learning Commission. Florida Gulf Coast University — located in Fort Myers — offers undergraduate and graduate degrees to an annual enrollment of more than 15,000 students. The student body includes learners from 45 states and more than 85 countries. FGCU offers over 100 academic programs. The school's interdisciplinary BS in health sciences is a web-based distance learning program that provides a solid foundation for those entering the healthcare profession for the first time. It also provides current professionals in the field a chance to increase their expertise and advance their careers. All upper-division courses required to complete the BS in health sciences at FGCU are available online. The university holds articulation agreements with many other schools, facilitating the transfer of credits and allowing associate degree holders to enter the program with advanced standing. However, program participants must complete at least 25% of their total coursework and 30 of their final 60 credits through FGCU. Courses in the health sciences major cover topics such as U.S. healthcare systems, health services administration, research methods in healthcare, and epidemiology. The school holds regional accreditation from the Southern Association of Colleges and Schools. Through SNHU's BS in health science degree completion program, students learn about collaborative practice, policy and regulation assessment, and standards used to improve patient care. This online health science degree is split into general education and degree-specific courses. Major courses, totaling 21 credits, include healthcare economics, delivery systems, quality management, and healthcare finance. Students round out their degree by completing 36 elective credits. This BS in health science program targets students who already hold an associate degree in allied health. Most admitted students work in allied health, filling positions such as diagnostic technicians, emergency medical technicians, medical assistants, and dental hygienists. SNHU's online health science degree aims to develop students' managerial perspective. Upon graduation, participants should possess the knowledge needed to foster organizational development; assess policies, regulations, and governance structure relevant to the healthcare delivery system; and apply healthcare management principles to improve the delivery of patient care. Based in Natchitoches, Northwestern State University of Louisiana opened in 1884 as a two-year college for teachers. Today, the institution serves over 10,000 students and offers add-on certifications, competency-based bachelor's degrees, and hybrid degree programs. Students can take courses on campus and online. NSU's global electronic campus offers 40 programs at various degree levels. The school's BAS in allied health is an accredited degree completion program that helps healthcare professionals obtain their bachelor's degrees. Available entirely online, this program enables professionals to continue working while improving their academic credentials. This online health science degree readies graduates for work in multiple clinical settings and allows for the transfer of up to 30 general education credits and 30 clinical coursework credits. To graduate, students must complete 120 credits, including 33 core curriculum credits, 57 allied health major credits, and 30 credits of clinical coursework. Participants can complete the program in two years. Participants can also opt to pursue a concentration in health science and technology, which focuses on patient care environments; this concentration requires the completion of 18 additional credits. Specific courses include foundations of healthcare, education in allied health, and healthcare quality. To apply, prospective students must hold an accredited associate degree in an allied health discipline as well as proof of licensure, registration, or certification to practice in allied health. NSU holds accreditation from the Southern Association of Colleges and Schools. Bay Path University uses five campus sites and an online international presence to educate a student body of nearly 3,300. The American Women's College, which operates as Bay Path's online undergraduate school for women, offers more than 20 accelerated online and hybrid degrees and six start dates each year. The school's online BS in health services administration — offered through the American Women's College — prepares students for careers as healthcare administrators and managers of healthcare services. The degree track emphasizes leadership and instills critical thinking skills, field knowledge, and the confidence needed to make informed decisions. Students pursuing this online health science degree learn to apply the latest theories and practices relevant to healthcare organizations, including strategic planning, human resource management, information technology, marketing, and funding. Courses include health services quality, policy and law in health services, healthcare finance, trends in healthcare marketing, statistics, and leadership in practice. Graduates can go on to become healthcare professionals capable of delivering effective, efficient, and high-quality healthcare to consumers. Transfer students make up 40% of new students each year at Bay Path, and learners can receive credit for former military service. Bay Path holds accreditation from the New England Association of Schools and Colleges. Indiana University–Purdue University Indianapolis was formed by the merging of two schools in Indiana. Today, IUPUI operates as an urban research university and offers more than 350 programs. Accredited by the Higher Learning Commission, the school serves upwards of 28,000 learners each year. The student body represents all Indiana counties, all 50 states, and 142 countries and territories. The school's BS in health sciences allows online learners to explore a host of health-related disciplines, preparing them for many career options. For example, students can explore topics like aging, rehabilitation, healthcare and society, and the U.S. healthcare system. The curriculum includes a total 120 credits, which students usually complete in four years. Years one and three are the most intensive, requiring participants to complete 34 and 33 credits, respectively. Students who choose to pursue a concentration in exercise science begin their first year by exploring kinesiology, human anatomy, and exercise science. In year four, these learners take on an internship and professional practice programs in physical education, health, and recreation. Students can further tailor their degrees to match their interests and career goals by pairing an online bachelor's degree in health science with a certificate or minor. Certificate options include gerontology, nutrition, personal training, and youth physical wellness programming. Available minors include coaching, adapted physical education, health education, and wellness coaching. A private health sciences college chartered in 1982, Jefferson College of Health Sciences — located in Roanoke, Virginia — serves more than 1,150 students. The college's online presence has increased dramatically in recent years, and over 66% of students currently take at least one online course. Jefferson College boasts accreditation from the Southern Association of Colleges and Schools. 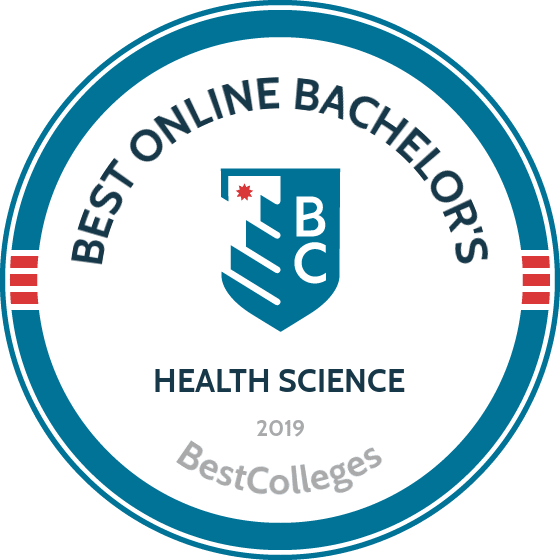 Available fully online or through a hybrid format, the BS in health sciences at Jefferson College is an integrated, nonclinical healthcare degree that teaches students about preventative care, healthcare philosophy, and health education. Learners gain foundational knowledge of core principles in public health and the behavioral, natural, social, and health sciences. They also examine the influences and factors impacting population health and healthcare delivery systems. During their senior year, students must carry out a 240-hour internship in their own community, complete a capstone research project, or engage in an 80-hour service learning project involving community outreach. These projects allow students to apply classroom knowledge in practical settings to start making a positive difference before they even graduate. The University of Massachusetts Amherst in Hampshire County is a public research university that holds regional accreditation from the New England Association of Schools and Colleges. UMass Amherst awards undergraduate, graduate, and professional degrees. The flagship campus enrolls over 23,000 students a year and features a faculty of 1,300 full-time instructors. The university offers more than 235 programs of study, including over 100 bachelor's degrees and 75 master's programs. Through the school's University Without Walls, students can complete their degrees and reach their professional goals entirely online. Students can earn a BA with a concentration in health studies through a degree completion program. This degree track helps learners sharpen their healthcare-related skills and qualify for career advancement. Students come from many different high-demand healthcare professions, such as healthcare administration, healthcare management, and health education. Students pursuing this online health science degree can transfer in up to 105 credits. Learners may also receive credit based on previous work and life experiences. The courses offered by this program include healthcare financial management, community development, health disparity, women's health, and globalization and health. Students can complete their degree entirely online without ever needing to visit Amherst. However, local students can opt to enroll in some blended or on-campus courses. A faith-based, Seventh-day Adventist institution, Kettering College offers certificate programs and associate and bachelor's degrees. The school also awards two advanced degrees in physician assistant studies and occupational therapy. Owned and operated by Kettering Medical Center, KC serves over 800 students interested in making healing their profession. Learners can complete a BS in health sciences at KC in four semesters. This degree completion program can be completed entirely online and requires no additional clinical hours. Part-time learners can also enroll, although it usually takes them about twice as long to earn their degrees. Similar to other online health science bachelor's degree programs, the curriculum for this degree track is split among general education, major, and elective courses. Students take seven core courses within the health science field on topics such as healthcare economics, health professions research, and community health. Electives allow students to further explore a particular area of health sciences, such as the history of healthcare in the U.S., managing personnel, and leadership theory relative to the healthcare field. Participants can choose from five areas of emphasis: sonography, respiratory care, education, advanced imaging, and management. Participants can transfer up to 30 credits from an associate program and 60 from a bachelor's program. KC only accepts transfer credit from regionally accredited institutions, and students must have earned a "C" or better for a course to qualify for transfer. Prospective students must submit transfer requests in writing. Kettering College holds accreditation from the Higher Learning Commission. Founded in 1970 and built in the Judaic tradition, Touro University Worldwide serves distance learners of all faiths. The online university enrolls more than 19,000 students a year and prepares graduates to enter the workforce or advance their careers. TUW offers 20 online programs in business, psychology, general studies, and health and human services. TUW's BS in health sciences features two concentrations: health education and healthcare administration. This online health science degree targets working adults aspiring to find work as lab managers, facility coordinators, and department managers in various healthcare settings, including hospitals, clinics, and rehabilitation centers. Faculty deliver most courses asynchronously, allowing students to continue working in the field while earning their degrees. Full-time learners who transfer 60 credits — such as those who previously earned an associate degree in allied health science online or on campus — can complete the remaining program requirements in two years. This fully online program requires no additional clinical work. The healthcare administration concentration provides students with a solid foundation grounded in theory and philosophy, while the health education track focuses on health promotion and working with communities to make healthier choices. TUW offers six start dates throughout the year. The school holds accreditation from the Western Association of Schools and Colleges. Boasting an enrollment of roughly 15,000 students, Texas Woman's University is the largest university in the U.S. primarily for women. In addition to its main campus in Denton, TWU maintains locations in Dallas and Houston. It also provides online programs in business, education, and general studies through its eLearning campus. TWU graduates more new healthcare professionals than any other university in the state of Texas and maintains membership in the Women's College Coalition. TWU offers three different degree paths for students aspiring to work in health sciences. Learners can choose from a bachelor of applied arts and sciences in health sciences (a degree completion program), a bachelor of applied sciences in health studies, and a bachelor of science in health studies. While the degree completion program is available as a hybrid program, the BAS and BS in health studies are both available entirely online. Students who hold an associate degree can pursue TWU's BAAS and chose from emphasis options in general health sciences, health studies, nutrition, and health-related business. Learners in the BAS track complete 21 credits of health studies courses and 15 credits of business classes. Finally, students pursuing a BS take 55 credits of coursework related to health studies topics, as well as a 360-hour internship during the last semester of their senior year. Participants can complete this field experience at nonprofit health agencies; wellness programs; and local, state, and national health agencies. TWU holds accreditation from the Southern Association of Colleges and Schools and awards baccalaureate, master's, and doctoral degrees. A liberal arts institution located in Highland Heights, Northern Kentucky University offers primarily undergraduate programming and serves an estimated 14,000 students a year. In addition to the school's more than 70 associate and bachelor's degrees, NKU offers graduate programs in business, healthcare, and nursing. The BS in health science at NKU is an online degree completion program that students can finish in as few as 12 months. This online health science degree targets healthcare professionals who already possesses an associate degree. Students can complete all of their remaining program requirements online. Faculty deliver distance courses through seven-week sessions. Students in this program gain a comprehensive knowledge of health sciences, which they can apply in a variety of positions across health-related organizations. Learners analyze healthcare information and data, study ethical and legal issues impacting the healthcare system, discuss and research current issues in the field, and acquire the leadership skills and applied management abilities to work with staff and health informatics. To apply to this degree completion program, students must have earned their associate degree in a healthcare discipline with a cumulative GPA of 2.3 or higher. Formerly known as Northern Kentucky State College, NKU attained university status in 1976 and holds regional accreditation from the Southern Association of Colleges and Schools. ASU features an expansive online catalogue, offering over 150 degrees to more than 25,000 online learners. Personalized learning environments enable students to receive a high-quality education while pursuing professional development and career advancement. The online BAS in health sciences offered at ASU is well-suited for learners who already hold an associate of applied science. This degree completion program requires participants to complete 19 courses, including cultural aspects of health, biostatistics, fundamentals of wellness, and complementary healthcare. Students must receive a "C" or better in all major-related courses and earn a minimum 2.0 GPA to graduate. In this cross-disciplinary program, participants gain the skills and knowledge needed to qualify for various career opportunities in health-related fields, including leadership roles. For example, this degree qualifies graduates to pursue employment as health educators, wellness coordinators, and community nutrition aides. The major curriculum is split into 10 terms, with students taking two courses per term; this format allows participants to focus on fewer courses at a time before moving on to new concepts. Students progressively build their knowledge while continuously reinforcing what they learned in previous terms. Earning a health science degree online prepares students to pursue healthcare careers in clinics, labs, offices, and hospitals. As you work through your online health science program, you can choose concentrations and coursework that align with your career aspirations. Keep in mind that program details vary based on the school and program you choose. While the application process varies from school to school, programs require similar materials. To enroll in a health science bachelor's degree, prospective students need to submit a high school transcript or GED score (schools consider competitive GPAs of 3.0 or higher). Many schools also require SAT or ACT scores to demonstrate your knowledge of math and literature. Schools typically consider competitive cumulative scores of 870 or higher on the SAT and 18 or higher on the ACT. Beyond basic records, applicants must submit personal statements detailing their reasons for applying. This written portion of the application -- along with letters of recommendation from previous instructors, mentors, and coaches -- allows you to share information on extracurriculars and personal interests that would not otherwise appear on transcripts or in test scores. The courses available in health science programs differ depending on the school and concentration you choose. Find a sample curriculum for common health science subjects below. Students explore the ethical issues related to practicing medicine, conducting medical research, and working in the healthcare field. The course applies philosophical concepts to practical situations often encountered in healthcare to help students navigate a range of ethical issues they may one day face. Learn about the structures that make up the human body, including cell tissues, bone structures, and muscular and nervous systems. Students also learn proper anatomical terminology related to the human body. This course often includes a lab component. The healthcare field "speaks" its own language. Learn how to communicate technical and scientific concepts and write lab reports, clinical reports, research papers, and other common healthcare communications. How Long Does it Take to Get an Online Bachelor's in Health Science? Many online health science programs target professionals who already hold an associate degree, so earning an online bachelor's degree in health science typically takes two years. Completing the program may take longer depending on the concentration you choose. Concentrations related to pre-professional studies often involve lab and internship components. Online health science programs that focus on nonclinical healthcare careers -- like healthcare management -- may not take as long to complete. As you explore different health science degree online programs, remember that the structure of the program may also affect how long it takes you to complete your program. Programs that follow the cohort model -- where a group of students work through the program together -- do not provide much flexibility. Other programs allow you to complete coursework at your own pace, so you can work around your schedule and possibly earn your online bachelor's degree in health science faster. An online health science degree prepares you for real-world experiences in the medical profession. The following list details the top skills a bachelor's in health science degree cultivates, including critical thinking, communication, and leadership. As you search for potential schools, peruse class lists to ensure you will receive the right training for your future career. Critical Analysis Learn to engage critically through the use of incoming test results, data sets, and community initiative proposals as a health science specialist in a hospital, clinic, or government body. Break down arguments and analyses concisely and propose alternatives with critical analysis skills. Collaborative Problem Solving Work with doctors, nurses, and specialists on collaborative issues, such as complex patient care and coordinated group case studies. Health science specialists need to know how to work in teams and provide community support. Communication Skills As core infrastructural professionals, health science specialists and managers need to speak across multiple knowledge bases, from medical professionals to patients and their concerned friends and family. Independent Research Analyze data sets, patient records, and administrative work-flow patterns as a health science specialist. Utilize your critical analysis, collaborative, and communication skills to convey research results to colleagues and the wider public. Leadership Your ability to take on increasingly administrative positions in hospitals and clinics depends on your leadership skills. Set standards and communicate expectations as a manager of medical professionals. Depending on the state, health science specialists may need a license to work as a clinical laboratory technologist. Though qualifications vary, licensure typically requires logged training hours or classes under professional supervision, successful completion of a laboratory technologist exam (administered by the state), and a licensing fee. Many states also require nutritionists to hold certification, and nutritionists with certification generally belong to associations such as the American Association of Nutritional Consultants. This organization maintains standards across the field and builds community networks that help nutritionists find and apply for jobs. Dependent on state regulations, health services managers like nursing home administrators require certification. To qualify, you must provide proof of training hours or enroll in a state-run intensive seminar, pass the state exam, and join any mandatory state association, such as the Arizona Board of Nursing Care. Online health science programs vary widely, so ensure you get a value-packed education. One indication that an allied health science degree online program constitutes a good value is its accreditation status. Accreditation indicates that a school meets certain standards and delivers a quality education. Most schools hold one of two types of accreditation: national or regional accreditation. National accreditation is usually reserved for institutions of higher learning that focus on a specific type of education, like distance learning or vocational training. Regional accreditation goes to an institution that meets the standards of a regionally accredited association. A degree from a regionally accredited institution is valid in any state. While one organization does not specifically accredit all schools within health science, the Commission on Accreditation of Allied Health Education Programs (CAAHEP) does provide accreditation for certain kinds of health science bachelor's programs. You can explore a list of accredited programs by visiting the CAAHEP website. Accreditation associations work in tandem with other organizations to establish the standards that institutions of higher learning must meet. Those organizations include the Department of Education ( ED) and the Council for Higher Education Accreditation (CHEA). The ED approves accreditors deemed reliable by the Secretary of Education. The ED can provide financial aid only to students who attend accredited institutions. CHEA, meanwhile, advocates for self-regulation among accredited institutions of higher learning to maintain standards. Over 3,000 colleges and universities belong to CHEA. To learn about accredited online healthcare degrees, you can check the list of accredited schools on the the ED website or the CHEA website. Experts project a strong outlook for all health-related professions in the years to come. This demand largely derives from an increased number of people receiving medical care in the U.S. More than 20 million previously uninsured Americans now receive medical coverage under the Affordable Care Act, and an aging baby boomer population adds to the need for qualified healthcare workers. Accredited online healthcare degrees open pathways to multiple career opportunities. Graduates of a health science program can pursue client-oriented occupations in nutrition and healthcare consulting, or they can work in laboratory situations as a medical technologist or health services manager. The following list details work habits and characteristics of some leading jobs open to health science degree holders. Consider your natural skill set as you prepare to pursue a career in healthcare management and technical analysis. Nutritionists help patients identify and ameliorate harmful eating habits as a nutritionist or dietician. Assess patient habits through frank and thoughtful conversation, and provide appropriate solutions to increase personal health and wellness. Health educators work in communities and schools to educate people about healthy lifestyle choices. Collect and evaluate data to assess community needs and limitations, and become an advocate for positive healthcare choices in your local community. Medical/clinical laboratory technologists investigate medical issues through careful analysis of test materials and lab results. Operate sophisticated equipment in a controlled environment to ensure accuracy of tests and results, and translate those results into comprehensive explanations for doctors, specialists, and patients. Healthcare consultants work collaboratively between doctors and specialists to identify issues in patients and troubleshoot solutions and medical treatments as a healthcare consultant. Liaise between patients and the medical professionals with whom they need assistance, and convey results clearly to keep patients fully informed. Medical and health services managers take on an administrative role as a manager. Improve healthcare by renovating and streamlining systems, improving information access, and protecting sensitive data by orchestrating a complex hospital or clinic system. As the table illustrates, all positions open to students of an online bachelor's degree in health science steadily increase in financial stability over time. The more lucrative positions include increased managerial components, specifically as a medical and health services manager or healthcare consultant. These positions also yield the most salary at the entry level. Even so, professionals should bear in mind that positions in nutrition and health education also greatly impact the local community. These varying components should impact your decision as you consider future career options. Making professional connections and learning about different approaches to health science improves your success rate in the field. Professional organizations offer a great entry point for students who want to learn more about their chosen career path. Below you can find three of the country's most prominent organizations established for health science professionals. These organizations host networking events, provide online trainings, maintain active job boards, and offer other services for career-ready college graduates. A nonprofit organization founded in 1872, the APHA strives to provide professional development opportunities for health professionals and develop meaningful public health policy. Members receive complimentary journal and periodical subscriptions, invitations to networking events, and discounts on continuing education courses and other services. Founded in 1917, the AND represents more than 100,000 dietitians, technicians, and other professionals in the field of nutrition and dietetics. The website features a wealth of health-related resources aimed at specific demographics like women, children, and the elderly. The AANC certifies nutritionists nationwide and prides itself as a standard in American nutritional health. This association keeps members abreast of new healthcare legislation and provides multiple certification exams designed to demonstrate member proficiency and professional investment. The association also provides special discounts on liability insurance to protect members from malpractice allegations. Despite the relative affordability of online programs, most students still need financial assistance. Students should complete a Free Application for Federal Student Aid (FAFSA) form to learn more about loans, grants, and other opportunities offered through the U.S. government. Additionally, nonprofit organizations and companies offer private grants and scholarships. Check out our collection of resources below to learn more about financial aid options for earning your online health science degree.